Foxboro senior Hannah Davis has been selected as the HockomockSports.com Player of the Week, presented by Morse Insurance, for June 3 through June 9. Davis is the 32nd player selected for the 2017-18 school year and the ninth player chosen during the spring season. 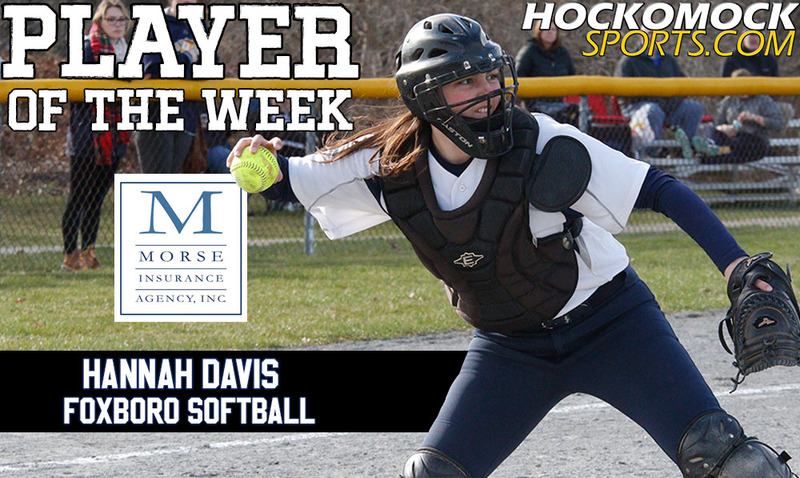 In the same week that she was selected as a co-MVP by the Hockomock League coaches, Davis recorded eight hits over two state tournament games to lead Foxboro, which is the No. 23 seed in Div. 2 South, into the sectional quarterfinal to face No. 2 Plymouth South on Monday. A four-year standout for the Warriors, Davis is the team’s leading hitter this season and a reason that Foxboro had confidence in going on the road and making a postseason run. In the preliminary round of the tournament at No. 10 Holliston, Davis went 4-for-4 with a stolen base and scored four times, as the Warriors won 6-3. She reached base in all five plate appearances on Saturday against No. 7 Bristol-Plymouth, going 4-for-5 with a triple, driving in a pair of runs, stealing a base, and again scoring four times. During the regular season, Davis was third in the league with a .508 average and drove in 20 runs for the Warriors. #6 Taunton, 6 vs. #11 Durfee, 7 – Final – Click here for a recap of this game. #6 Oliver Ames, 3 vs. #11 Bishop Feehan, 2 – Final (9 inn.) – Click here for a recap of this game. #20 Foxboro, 7 @ #13 Cardinal Spellman, 9 – Final – Foxboro twice rallied to tie the game but the Cardinals took the lead for good with a pair of runs in the sixth inning. The Warriors took a 2-0 lead but Spellman responded with five runs. Foxboro rallied to tie it 5-5 with three runs in the top of the third but again, Spellman answered with two runs to take the lead back. Foxboro tied the game with two runs in the top of the sixth but the Cardinals pushed the go-ahead runs across in the bottom half. Devin Hassett had three hits, three RBI, and a run scored, Joe Cavaleri (two runs) and Robert Theriault each had two hits and Chad Bearce added a hit, RBI, and two runs scored. #23 Foxboro, 6 @ #10 Holliston, 3 – Final – Hannah Davis went 4-for-4, including two doubles, and stole a base to lead the Warriors to a win in the preliminary round of the tournament. Morgan Sylvestre and Lexi Buckner each added two hits apiece for the Warriors, who had 12 total hits as a team. Emma Rohan tossed a complete game without issuing a walk while striking out one. #4 Foxboro, 6 vs. #5 Concord Carlisle, 9 – Final – Click here for a recap of this game. #5 Oliver Ames, 15 @ #4 Plymouth South, 11 – Final – Oliver Ames scored seven goals in the first half and then found the back of the net eight times in the second half to upend Plymouth South. Colin Bourne led a well-balanced Tigers attack with four goals, Eric LeBlanc scored three times and Owen Gallager, Frankie Ireland, Sam Stevens and Hunter Costello each chipped in with a pair of tallies. Head coach Ben Devlin added his defense had a strong game as well. #6 Canton, 11 @ #3 Sandwich, 10 – Final – Canton orchestrated a second half comeback to stun third-seeded Sandwich. The Bulldogs trailed 8-4 in the third quarter but rattled off a 7-0 run to take the lead. Senior captain Kevin Albert scored the fifth goal in that run as time expired for put Canton up 9-8, its first lead of the game. Sandwich pulled within a goal with just over three minutes left but a strong defensive effort prevented the tying goal. Head coach Bill Bendell added that Charlie O’Connor and Nick Mackay had big days at the face off X for Canton. #2 Franklin, 16 vs. #7 Lexington, 4 – Final – Franklin raced out to an 8-2 lead at halftime and duplicated that score in the second half to beat Lexington and advance to the D1 East Semifinal. Erin Walsh (four goals, two assists) and Annie Walsh (five goals, assist) tied for a team-high six points while Kelsey MacCallum (four goals, assist) chipped in with five points. Katie Jones had three goals and one assist for the Panthers and Corrine Lewis had a strong game defensively with two caused turnovers. Franklin will host #3 Concord Carlisle on Monday at 5:00. #3 Foxboro, 6 vs. #6 Medfield, 8 – Final – Click here for a recap of this game. #1 North Attleboro, 5 vs. #16 Natick, 0 – Final – North Attleboro opened up its playoff campaign in style, winning all five matches in straight sets. Richard Bermudez earned a 7-6 (2), 6-4 win at first singles, Christian Bermudez picked up a 6-0, 6-2 win at second singles, and freshman Jonah Manso didn’t lose a game at third singles in a 6-0, 6-0 win. Ben Pfeffer and Vikram Senthilkumaran earned a 6-2, 6-0 win at first doubles and Alex Pfeffer and Sam Gallagher notched a 6-0, 6-2 victory at second doubles.